Campaigners and shoppers on Broadmead handed a giant letter of complaint signed by more than 200 shoppers to a Sainsbury’s store manager on Saturday 28 October in protest of the supermarket’s decision to abandon the Fairtrade mark on a range of its own-brand teas. 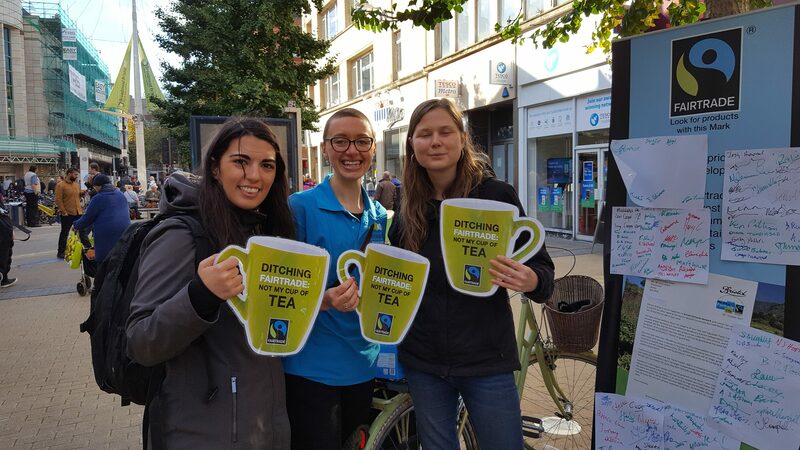 Members and supporters of Bristol Fairtrade Network gathered outside the city centre supermarket, collecting signatures for the larger than life letter and distributing tea bags that do carry the Fairtrade mark from rival supermarkets. The group’s protest aimed to raise awareness of Sainsbury’s decision to replace the Fairtrade Mark on its Red Label and selected other teas with its own ‘Fairly Traded’ label. Fairtrade guarantees that tea producers receive a premium payment in addition to the price of their tea, which they can use in to invest in their businesses and communities as they choose. Bristol Fairtrade campaigners are concerned that the equivalent premium offered by Sainsbury’s takes control away from tea producers, with suppliers instead having to apply to a UK-based board for funding. Protesters also expressed anger that the ‘Fairly Traded’ standards are controlled by Sainsbury’s themselves, rather than an independent board. Tea farmers will not be represented in the scheme’s governance, in contrast to Fairtrade certification where producers have a 50% stake in the scheme and are part of deciding how standards are set, monitored and reviewed. Bristol was first awarded Fairtrade status in 2005 and the city is considered one of the most active Fairtrade cities in the UK, playing host to the International Fair Trade Towns Conference in 2015 as part of the Green Capital celebrations. The Bristol Fairtrade Network campaigns to raise awareness in the city of the continuing need for Fairtrade in global trade, and to show people that simple shopping choices have the power to change lives in producer nations. The Network hosts the annual South West Fairtrade Business Awards, which encourages businesses across the region to support Fairtrade in the workplace. Saturday’s protest formed part of a national day of action supported by CAFOD, Christian Aid, The Women’s Institute, Traidcraft Exchange and Tearfund, which was called after an open letter to Sainsbury’s sent in May this year from East & Central Africa and Southern Africa Networks of Fairtrade Africa – representing over 220,000 African tea producers – failed to convince the supermarket giant to reconsider the adoption of the new scheme. British tea drinkers account for three quarters of Fairtrade tea sales globally, and Sainsbury’s is the world’s largest retailer of Fairtrade. “Buying Fairtrade tea is a proven way to make a difference every time we drink a cup of tea, and the action by Bristol Fairtrade Network shows the mark is widely supported in the city and indeed, across the country.